Perfect planted up in pots and containers for a harlequin effect of colour that will last all summer-long. Commonly known as 'Granny's Bonnet', Aquilegia are a charming cottage-garden perennial. Their brightly coloured flowers are also attractive to bees, butterflies and pollinators. 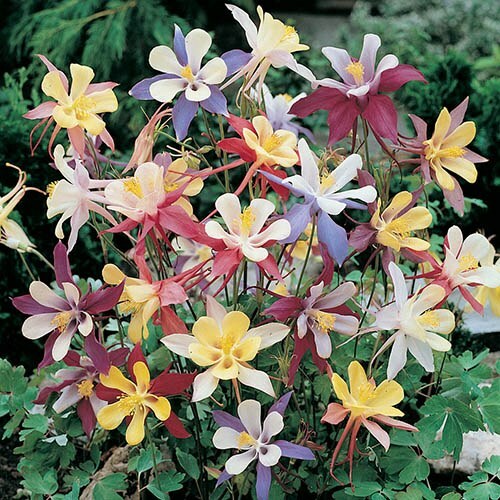 Easy to grow in both sunny or partly-shaded areas, Aquilegia are winter hardy. Supplied as a collection of 12 jumbo plugs. These rather unique and superbly colourful hardy perennials look fantastic planted up in pots and containers or patios for a harlequin effect of colour that will last all summer long. Commonly known as 'Granny's Bonnet', Aquilegia are a charming cottage-garden perennial with flowers in the shape of bonnets - hense the name! these two-tone blooms nod in the warm breeze on a sunny day and brighten up the gap between the end of spring flowering bulbs and the arrival of summer flowers. Their brightly coloured flowers are also attractive to bees and butterflies and will bring your garden to life with beneficial wildlife! Easy to grow in both sunny or partly-shaded areas, Aquilegia are great for pots and containers but just as happy planted straight into the ground in borders. Winter hardy, they'll come back each and every year even bigger and even better. They make stunning cut flowers too!